The Sanskrit name of Itumbahal, ‘Bhaskardeva Sanskarita Keshchandra Krita Parawarta Mahavihar’ is a clue, which explains the historicity of Itumbahal. The legendry figure Keshchandra who has believed to have constructed, Itumbahal is still elusive. Some historians date him about the 11th century AD. In those days Kathmandu is under the rule of king Bahasrkardeva of Nuwakot. Keshchandra was a gambler son of Bhaskardeva, a Thakuri king of Nuwakot, once he lost everything in gambling, disheartened, he went to the jungle, to be returned with sack full of Gold, then he established huge monastery and named it as “Bhaskardeva Sanskarita Keshchandra Krita Parawarta Mahavihara” The nearest meaning of this Sanskrit name is as follows: – ‘The pigeon monastery founded by Keshchandra with the patronage of Bhaskardeva’ earlier this monastery is familier as Suvarna Mahavihar. Besides the Sanskrit name of Itumbahal, we didn’t have any authentic evidence about the founding of Itumbahal by Keshchandra himself during the time of Bhaskardeva. According to Daniel Wright, Itumbahal must have been established around NS. 200 (1080 AD.). 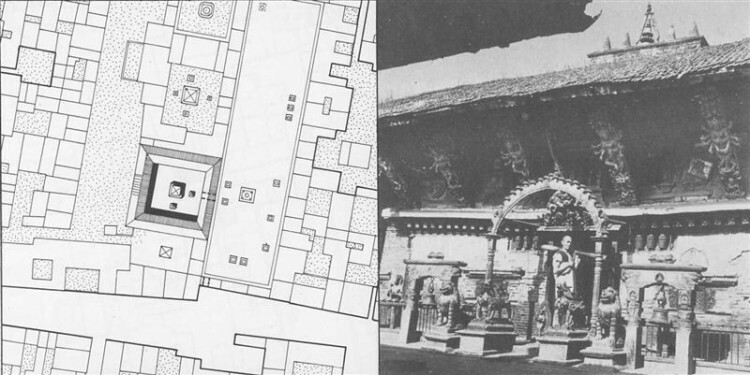 The Swoyambhu Purana gives an evidence of king Bhaskarvarma, who ruled around 11th century, and with his name vihara was constructed by Keshchandra In Gopalraj vansawali, it was mentioned that a stranger from Patan came to Kathmandu to open the fort gate of Yatum Vihara (Itumbahal) in the year NS. 361(1241 AD). The earliest dated inscription yet found in Itumbahal is of NS. 502 (1382 AD). It has been mentioned that during the time of King Jayasthiti Malla a high ranking court official ‘Madan Ram Vardan’ and his wife established the figure of Dipankara and constructed the shrine of Arya Tara. The earliest written document with the mention of Itumbahal is found in Gopalraj Vansawali, where it has been mentioned that “during Sambat 361, (1241 A.D.) a gentlemen from Patan named Kirti Bharo came to Kathmandu and opened the fort gate of ‘Yatum Vihara’”. The mention of Yatum Vihara with dates NS. 361 give us an evidence of probability of existence of Itumbahal at least 200 years before NS. 361. According to unpublished document of late Thayapa Moti Kaji Shakya, written in 2052 BS, Itumbahal is famous as ‘Subarna Maha Vihar’ with golden roofs and pinnacles; later Keshchandra, repaired it and re-named it as ‘Keshchandra Krita Parawarta Maha Vihar’. According to Mary Slusser, who has seen the scroll painting (Bilanpau) of Itumbahal, wrote in her book, that it bears a clear dates of V.S. 1280 (A.D. 1233, NS 353) as a foundation dates of Itumbahal. Another written evidence with the full Sanskrit name of Itumbahal as a Bhaskar Deva Sanskarita Keshchandra Mahavihar has been found at the end of a manuscript Pragyaparmita dated NS. 478; (1358 A.D). In this manuscripts it has been mentioned that on the auspicious 10th day of Bhadra Suklapaksya NS. 478 a Sakya Bharu Buddhacharya Sri Rajbramha of Bhaskardeva Keshchandra Mahavihara had concluded the celebration of Lakshyabhagwati. In the colophons of many religious text books, written in late medieval period, also mention the full Sanskrit name of Itumbahal. It proves that religious teachings and rituals were carried out in the Itumbahal during medieval days. The earliest dated inscription yet found in Itumbahal is of NS. 502, 1382 A.D. This inscription is a significant source of evidence in studying the socio-political and religious situation of medieval Nepal. It highlights about the donations of Dipankar figures to the Vihara and establishment of Arya Tara shrine by Jayatra Laxmi wife of Madanram Vardan in the Itumbahal complex. After NS. 502 many inscriptions of NS 682, NS 714, NS 783, NS 795, tells us more about the donations and establishment of many figures (Statues) and celebration of festivals like Samyek Mahadan etc. According to Vamsawalis, the Lichhavi dynasty ended with the death of last Lichhavi ruler Jaya Kamadeva, in the beginning of 11th century; thereafter Bhaskardeva came from Nuwakot and ascended the throne and even acquired the title of “Param Bahttaraka Maharaja Dhiraja Parameswari’ as mentioned in the colophon of manuscripts dated N.S 167 (1047 AD). He ruled for a short period of 3 years, NS. 165-167 (1045-1047 AD) after that he jointly ruled with Jayadev for 10 years, altogether his reign period is about 13 years from N.S 165-178. (1045-1057 A.D). There is no uniformity among historians about the dates of Bhaskardeva, however, one thing is certainly clear that he was a vaisya-thakuri who came from the hills of Nuwakot and ruled over the Kathmandu valley during the middle of 11th century. Historians like, D.R. Regmi believes that Bhaskardeva was elected by the people to fill up the vacancy caused by death without any issue of the last king of the preceding dynasty of rulers, he ruled probably around NS 167 or (1046 A.D.). Keshchandra, as a founder of Itumbaha. According to the Bhasha Vamsawalis, Keshchandra was a renowned businessman and contemporary of king Guna- kama-deva, who ruled both in Kathmandu and Patan for about 51 years around 10th century. Keshchandra went to Tibet for merchandise, and came back with enough gold to construct a Buddhist monastery i.e. Itumbahal. But according to Daniel Wright, Keshchandra was contemporary of King Hari Deva, who ruled in the valley in the later half of 11th century. Keshchandra was a son of Bhaskar Malla. His father died when he was young, unable to take care of himself he proceed on gambling, until he lost every thing and left the city to wander into surrounding jungle. On the way with the miraculous blessings of Kirtimukh Bhairaba he returned back to valley with tons of gold being carried by Gurumapa, later he married the daughter of Raja Harideva. He has a son, who died in his early youth and out of grief he established the monastery, named it as a Parawarta Mahavihar, because all his wealth was derived from the pigeons, people afterwards named this Vihara as Itumbahal. According to the Swayambhu Purana, around 11th century A.D. there was a king named Bhaskar Varma. During his reign Keshchandra established the monastery which inherited the reigning monarch’s name. Gurumapa was a demi god- Bhairaba who helped Keshchandra, the founder of Itumbahal to construct Vihara. He was a legendry figure and contemporary of Keshchandra, who found him in the forests of Swayambhu (according to Swayambhu Purana). While he was collecting gold droppings of pigeons, suddenly; Gurumapa appeared out of nowhere and threatened to eat, Keshchandra alive. He cleverly called him as maternal uncle and a good person and asked him to carry a sac full of gold up to his house in Itumbahal in exchange of a mun of rice and a buffalo to eat forever. Gurumapa agreed and carried sac full of gold up to Itumbahal (House of Keshchandra) accordingly, Gurumapa resided at Itumbahal and was given rice and meat to eat. Later he developed the habit of cannibalism. Initially, Gurumapa used to eat dead small kids, later he devoured, live children; this embarrassed Keshchandra, even his only son became a victim of Gurumapa; now people demanded Gurumapa be expelled from neighborhood and dump at the open field of Tundikhel outside the city of Kantipur. Keshchandra bought Tudikhel and Gurumapa was resided there. Every year on the full moon day of Falgun- a mun of rice and meat of a buffalo is sent for Gurumapa – as promised by Keshchandra. The tradition is still carried on in remembrance of promises made by Keshchandra to Gurumapa. According to Tibetan sources, there was a famous saint with the name of Guru Marpa who stayed at swoyambhu for three years in between (1042-1045AD) on his way towards pilgrimage to India. Until and unless there is strong evidence, one cannot say that saint Guru Marpa of Tibet and Gurumapa of Itumbahal is a same person. Itumbahal might have been existed during the Lichhavi period of 7th-8th century. There is no tentative date of construction of Itumbahal, but we can only guess the nearest time and period of construction of Itumbahal. The sources like inscriptions, manuscripts, art and architectural evidence, legends, social and ritual practices will be taken into account to reach a conclusion about period of construction. Itumbahal has a unique tradition of fetching water from well in Itumbahal to bath the Bungadya at Lagankhel in Patan. The tradition of bringing water from Itumbahal to Bungadya must have been continued ever since the start of the tradition of Bungadya Rathajatra, i.e. since 7th century A.D. There is a special guthi to look after the tradition. But it has been discontinued now. It is significant, that Itumbahal must have been existed at the time of introduction of Bungadya into Nepal by Lechavi king Narendradeva. There must have been some kind of shrine during the Lechavi period. The well ‘I-tum’ near Itumbahal existed even before the construction of Itumbahal. The very name of Itumbahal is derived from this Well. Both the legendry figure of Keshchandra and the king Bhaskardeva are historical personalities. The legends of Keshchandra going towards the Bhagwan Bahal, where his sister lives, makes a point about the existence of Bhagwan Bahal during the period of Keshchandra. Historically, we know that Bhagwan Bahal has been constructed by Atisa Dipankara in 1041 A.D., (NS. 161) when he visited Kathmandu valley on his way towards Tibet. Itumbahal as a full fledged vihara including sangha, makes its existence only after Atisa’s visit in 1041 A.D., during the reign of king Bhaskardeva (1045-1057), and Guru Marpa’s visit to Nepal (1042-1045 AD) on his way towards India. King Bhaskaradeva ruled for a short period in 1045-1047AD. With those evidences it must be said that Itumbahal was established by Keshchandra in 165 NS (1045 AD) and renamed as “Bhaskara deva sanskara keschandra krita parawarta mahavihara”, there must be a Buddhist shrine before it’s foundation in 165 NS.